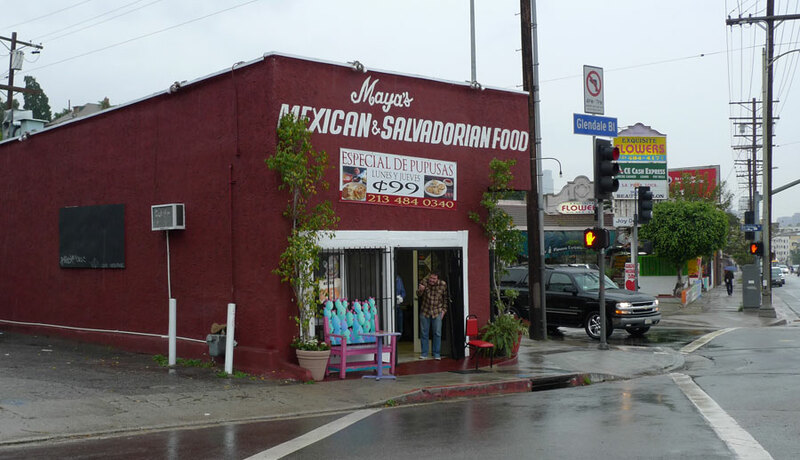 Garrett, Kirsten, Carmen and I went over to Russ’s side of town, and at his suggestion the five of us went to Mayas Tacos in Echo Park. 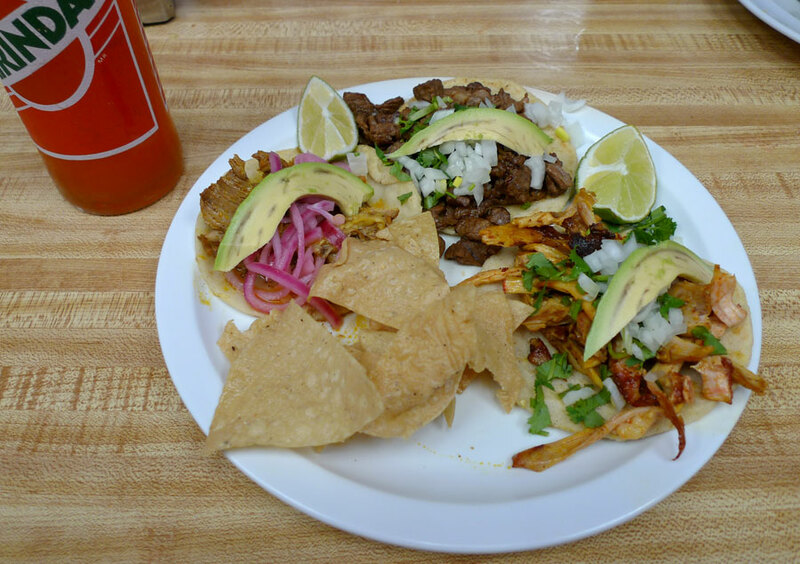 Russ revealed himself to be fond of the Cochinita Pibil taco (“dirty little piggy”, a savory stewed shredded pork). I ordered three soft tacos, one each with the cochinita pibil, the steak (“tasajo”), and chicken, along with a half-liter bottle of Mirinda orange soda. Carmen ordered the pibil taco as well as one each with wet chicharron and dry chicharron. Tacos were above average in size, and $1.25 each – an excellent value. Mayas provides a smattering of freshly-fried tortilla chips with your plate of tacos, and a small dish of a habanero-based salsa that is hot as the sun, and should be taken sparingly. The tortillas are quite unusual – they are handmade, and about 3mm thick, and served single-ply. They have a nice bumpy texture, but are soft and pliable rather than leathery. The pibil was deliciously savory, and topped with citrus-pickled pink onion strings. I took a bite of the avocado and then removed it from my taco. The downside to this taco is that the soupiness of the meat soaked through the tortilla, and the underside of the tortilla felt wet and clammy as I picked it up. Russ tells me that, with respect to this pibil-soaking-tortilla phenomenon, the tacos vary. Then I moved on to the steak, which they called Tasajo. There was plenty of meat on this taco, and it was delicious, savory, salty, slightly buttery, cooked just right. The chunks were of good and varied size, and there was so much meat that its bulk spilled a few chunks from the ends of my taco when I picked it up. But rest assured, those pieces did not go to waste. Finally, I ate the chicken taco. I put on two spoonfuls of the habanero salsa, which made my mouth and face burn for a decade. This was the best chicken taco I’ve ever had – in long, stringy bits, strongly flavored, and not soupy, it was Taco Appropriate and Taco Righteous, unlike the chicken at many taquerias which seems like it would do better instead as a burrito, paired with a flour tortilla, rice and beans. This is awesome James! Are you ordering in Spanish too? I don’t want to seem patronizing. If I ever go to a place where my Spanish is better than the server’s English, I’ll give it a shot.